That’s what the teacher said as she pushed a few naughty boys through the door of our classroom. They must have been about eight years old and committed some terrible transgression like throwing spitballs or putting chalk in the erasers. We looked up to see our own teacher, Mrs. Friedlander, place them in a corner of the room. What was the punishment? Who wouldn’t want to be back in kindergarten? 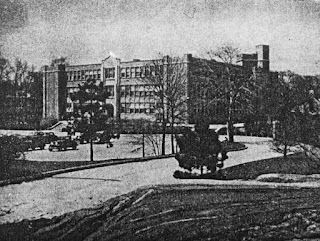 Martin H. Traphagen School, 1940s (before my time). Kindergarten entrance was around the left side of the building. I remember feeling very pleased that our kindergarten had its own entrance, tucked away on the side of a monolithic four-story school constructed during the mid-1920s. The door looked like it had been drawn by Beatrix Potter herself; one almost expected Peter Rabbit to hop out. Instead, there stood Mrs. Friedlander, looking very postwar in a flowered dress and beads. A friendly woman, she did once scare us by grabbing a classmate and washing his mouth out with soap. We’d heard about the punishment but never witnessed it. No water required: take one bar of soap and insert into pupil’s mouth. In my imagination, washing out someone’s mouth with soap involved lathering and rinsing and patting dry with a towel. So this was a revelation. Thirty-four years later, I forgave her for the soap incident. Once you stepped through the Peter Rabbit door, the kindergarten opened into a double-height space with sunlight flooding in through a tall, wide bay window. There was a piano, a fireplace, and a loft, a balcony of sorts where we were allowed to play unsupervised. Although it may sound strange to say, this was a room that respected children. In 1997 when I started to study the history of American education, it came in a flash that our kindergarten was a perfect example of how the progressive education movement influenced school architecture. 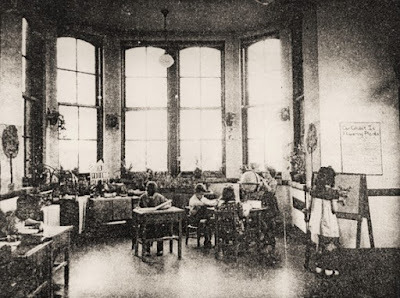 The basic idea behind progressive education was to free children from recitation and drill –the one-room schoolhouse model that had dominated American education since the early nineteenth century. Colonel Frances W. Parker, a Civil War veteran and teacher, challenged the lockstep archetype as early as 1875 as superintendent of the Quincy, Mass., schools. Others followed, including the famous philosopher John Dewey. Slowly, the ideas caught on and the Progressive Education Association formed in 1919. Progressive education reached the peak of its popularity in the 1920s and ‘30s. Most of the tenets associated with its philosophy – the teacher is a guide, learning by doing, experience is education – translated brilliantly into classroom practice although not everyone got it right, of course. In the years following World War II, progressive education was vilified for several reasons. Notably, the launch of Sputnik led many parents, educators, and government officials to warn that American students were not competitive academically, especially in math and science. That started the business of perpetually reinventing the school curriculum which has brought us to our current predicament. I’m really skimming through history here. Suffice it to say that the kindergarten I knew, with its separate activity areas that encouraged moving around and individual experimentation, and even a table where we grew plants, was designed for a child-centered program. The Peter Rabbit door, built to the scale of children, intended to make us feel welcome. Inside, the organization of the room encouraged playing and learning. in 1963 it appeared much the same. A few months ago, while strolling with a friend, I stepped off the curb and pitched forward, twisting my ankle and slamming my hand. The last time I fell so hard was during kindergarten. In 1963, walking home from school, carefully carrying the top of an onion that had sprouted green leaves, I saw my mother waiting for me at the next corner, excitedly started to run, and went sprawling. The onion flew from my hands into the future, where I now sit telling this tale. Funny, I was thinking the other day of you being the valedictorian in 6th grade and given the speeck (or invocation?) and I got to "conduct" the choir.